Carla Creates: Every Girl Like Me - New Challenge Song! Every Girl Like Me - New Challenge Song! We have a new challenge song to share with you at Scrap it with a Song! We are featuring "Every Girl Like Me" by Sugarland this week! My layout features the soon to be retired Typeset paper from CTMH. I embellished with a doily I picked up at the dollar store and the paper butterflies are the Just Blooms Flutter Paper Shapes from CTMH. The tag is cut with the CTMH Art Philosophy cricut cartridge. Alphas are from the dollar store and the mini alphas are from Making Memories. Kraft border is from CTMH. Ribbon is retired vineyard berry ribbon from CTMH. Hope you'll join us at Scrap it with a Song with your music-inspired creations! 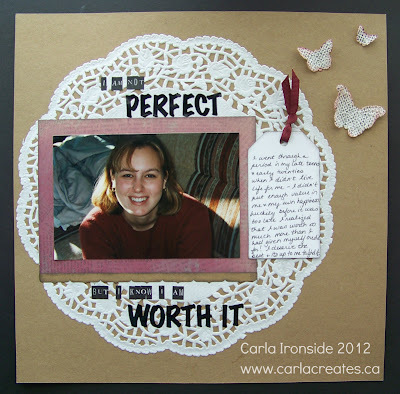 What a great layout, Carla!